The gold Compass 2 for iPad from Twelve South is designed to be a multi-use stand optimized to work with the 9.7" iPad Pro and all generations of the iPad Air and iPad mini. It supports your iPad in both landscape and portrait mode. 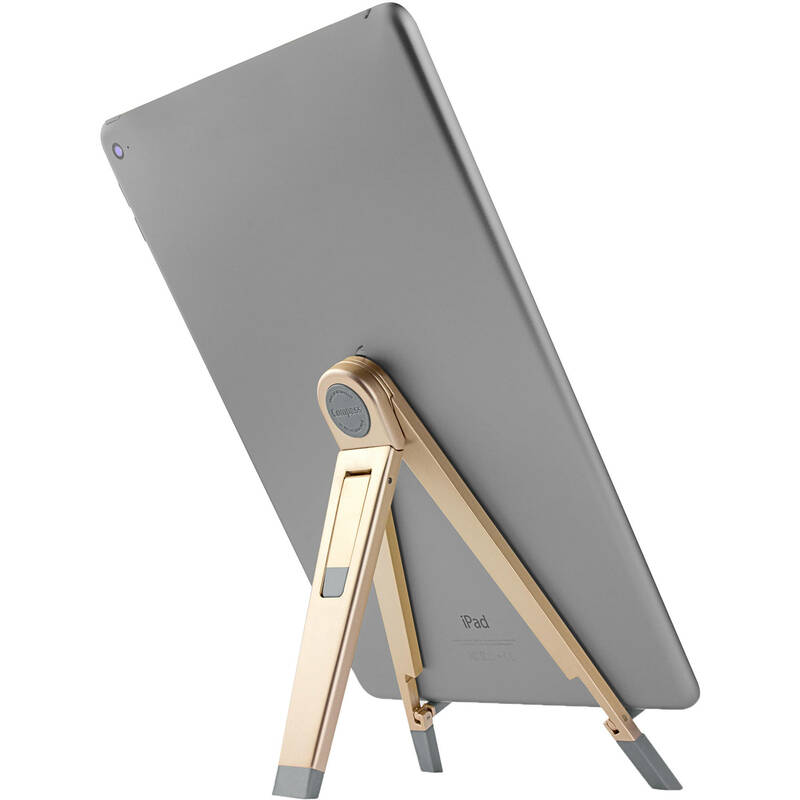 Moreover, this compact stand serves as a stable easel that holds your iPad in portrait or widescreen mode. Use the Compass 2 for hands-free viewing and interacting with your iPad. You can also flip down the secondary leg, so the Compass 2 becomes a comfortable typing stand. This stand is made from machined, heavy gauge steel, which allows you to fold it flat. It includes a soft travel sleeve, so you can take it everywhere your iPad roams. Hold your iPad or iPad mini in portrait mode for video calls. It can be used in a vertical or horizontal orientation. This stand elevates your device, so the camera sits high and you don't have to slouch when you chat. Its tall, wide angle is designed to be stable, so you won't have to worry about knocking your iPad over when you tap the screen to launch an app, play a video, or swipe a page. The back leg of Compass operates like a car door. Flip it open and it stays open, close it and it stays closed. Place your iPad on its side in landscape mode and the Compass 2 becomes a portable theater. This stand has soft rubber feet to protect the surface you set it on. Rubber along the legs protects the surface of your iPad. The Compass 2 elevates your iPad, so you don't have to worry about your iPad while cooking or doing similar projects. This stand features a fold-away secondary leg that creates a comfortable typing angle.